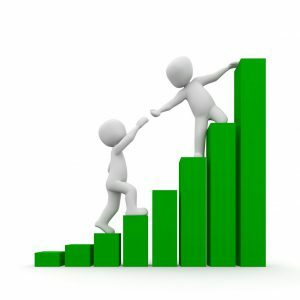 Employee Engagement – Solutions that Work! And yet many are skeptical about employee engagement surveys. If you are one of these people, there is a reason. Traditional engagement surveys measure the outcomes of engagement. Think of your body’s health. There are lots of things a health practitioner can measure to determine good health. Body temperature, blood pressure, pain. These are indicators of the state of health. Engagement surveys measure the indicators of employee engagement. It isn’t possible to directly treat the indicator to solve the root cause. If I have a fever or a headache, I might take Tylenol to relieve the symptom. I’ll feel better for a while, but the underlying cause had not be treated. In the same way, if I try to improve an indicator of poor employee engagement, I may get temporary results, but the root cause will not have been dealt with. Employee engagement scores may go up a bit, but they will not improve for the longer term. Most Engagement Surveys have “Poor Communication” as a result that “needs improvement”. But will improving communication improve engagement, or is poor communication an indicator of poor engagement? These are real issues. They are flagged as poor communication because that is the best language the employees have to describe the situation. When the executive management team sees “poor communication” in the results of an employee engagement survey, the correct course of action is not to publish more newsletters or send more memos, or hold town halls. Poor communication is a symptom of a deeper root cause problem: the absence of a formal accountability and authority framework. The employees may express a lack of communication, but the real issue lies in the managers who have failed to establish and maintain open and working channels with their employees. The information must be provided by setting proper context in the right size and at the right time to be meaningful to an employee. Only a manager can do this – it cannot possibly be done centrally. 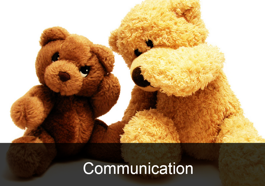 This is a manager effectiveness issue – certainly it is about communication – but it cannot be improved by tackling communication at the organization-wide level. It requires different behaviour by managers. When people have a clearly defined purpose they know what to do and what not to do. Accountability is an outcome of a clearly defined purpose with the right actions. Poor Workplace Collaboration usually ranks high in engagement surveys. Why? 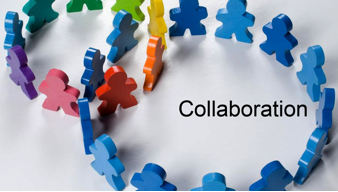 Again, the root cause is not poor collaboration. There isn’t a lack of willingness for colleagues to support each other; there is no innate desire to sabotage co-workers. Each employee in each department is receiving direction from her or his boss on what is important. Cross functional work is almost always treated as a “nice to do” or a favour, instead of real work. An effective manager supports others in the organization, monitors workflow, and ensures that the day-to-day work of his or her staff is improved by working together, rather than by working in silos. This can only happen within a framework that is set by the CEO and within common context throughout the organization. After Nearly Two Decades of Engagement Measurement – Are We Making a Difference? Look at this graph derived from data published in Gallup’s State of the American Workplace. Since the Year 2000 employee engagement has hovered around 30%. I don’t have access to the original data to be certain, but as a researcher my eye tells me this is a remarkably flat trend line. 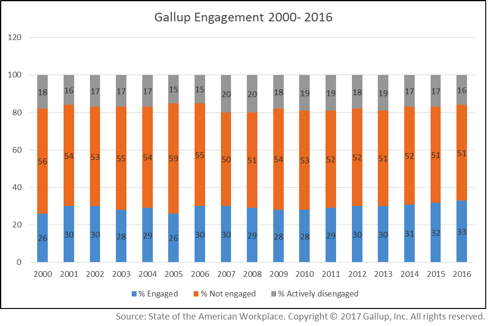 Only about 30% of the American workforce have been engaged throughout this entire period of time. That means that 5 out of every 10 workers is coasting and 2 out of 10 are actually working against the organization that employs them. And it has not changed significantly since the turn of the century! This is the first of a 3-part series. To learn how to improve engagement in your organization, read Part 2 here. Check out the Infographic here.